What is a Gluteus Medius Tear? 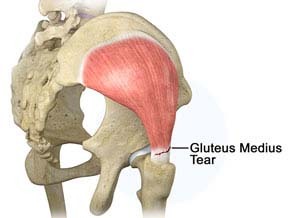 The symptoms of a gluteus medius tear involve pain and tenderness over the lateral aspect of the hip which may be aggravated with activities such as running, climbing stairs, prolonged sitting or walking, and lying on the affected side of the hip. One of the main symptoms of a gluteus medius tear is the presence of the Trendelenburg sign, evidenced by the pelvis dropping towards the unaffected side during ambulation, from being unable to properly bear weight on the affected limb. Diagnosing a torn gluteus medius muscle starts with a physical examination of the patient including palpation of the affected muscle, testing muscle strength and assessing the walking pattern or gait of the patient. Special tests such as the single-leg squat test or positive Trendelenburg sign confirms the Diagnosis of a gluteus medius tear. MRI or ultrasound scans may be helpful to view the pathological changes of the muscle. Surgical treatment may be recommended to repair a complete, full-thickness gluteus medius tear. The surgery can be performed endoscopically through tiny incisions to reattach the torn tendon back onto the greater trochanter with sutures. This helps to restore strength and function to the gluteus medius muscle. The gluteus medius is one of the main muscles of the hip that works to stabilize and control various hip movements. A tear or rupture of the muscle can result in pain, improper gait, and disability. Treatment includes surgical and non-surgical methods and the selection depends on the extent of the injury and the lifestyle of the patient.